Good luck, and keep the great entries coming! Green Guy: Oh well, at least I saved money by switching to Geico. well…sir we have some good news and some bad news.the good news is that you won a free cat,but the bad news the cat got shaved,now theres a hairless cat running around.so the good news is that you got 75$ for it.the bad news is we droped in the fireplace and its now ashes.Well….. the good news is that i saved a hole bunch of money by switching to gieco!!!!!!! WIERD COLOR DUDES:WHO IS SHE?? greendude:WHO ME!! REALLY…..PLEASE DON`T HUG ME!!!! Thought balloon: “Please, oh please stab me with that sword. I don’t think I’m going to like what the Green Gladiators have in store for me. Waaahhh! guys i yold you a millon times im not Michle Jackson!!!! really[the greeen dude gets kicked in the balls]owwwww!! [greendude made a michle jackson noise]ok, maybe i am………………….. greenman:tralalalalalalalalal! !oh look the last Moutian Dew Code Red!!! This wasn’t in the training…but, I like tight butts and I cannot lie!!!! Another reminder, please keep the entries appropriate for a broadcast TV sitcom, please. Green man’s thought: Note to self: use the gold skin paint tomorrow, not green. Dewd: Ok, this is beyond a joke. get off or-or i swear i’m gonna grit my shiny teeth. Don’t touch my girly hair! AGH! Green dude: I..I promise President Bush told me I could push the big green button. Who knew nuclear fallout turns people green. Balloon: Leave me alone. I don’t have an asparagus problem! waen I siad grop hug I didn’t mean everyone in the room! 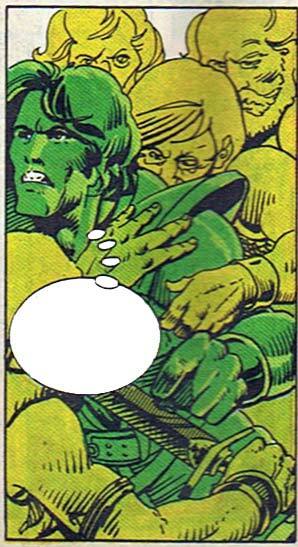 Green GuY: Man that febreeze doesent smell THAT good…Does it? Thought Balloon: Dammit, these Comic-Con purists are brutal! I should have put more thought into my Hulk costume, and *why* in God’s name did I call the character “David” Banner?? ThoughtBalloon: Grandpa’s Idea about a life insurance doesn’t look like a bad idea now. Damn these L.A. cops! A traffic violation doesn’t deserve this! Thoughtbaloon:Damn these L.A. cops! A traffic violation doesn’t deserve this! Thoughtballoon: Why’s he got a camera..? Oh this better not end up on YouTube! Thought balloon: Barbarian repellent my keister! Thoughtballoon: THIS is the LYNX effect?! ?